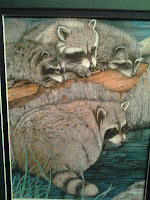 Mark and I happen to be fans of original artwork depicting various wildlife. This is a picture of a recent addition to our collection. 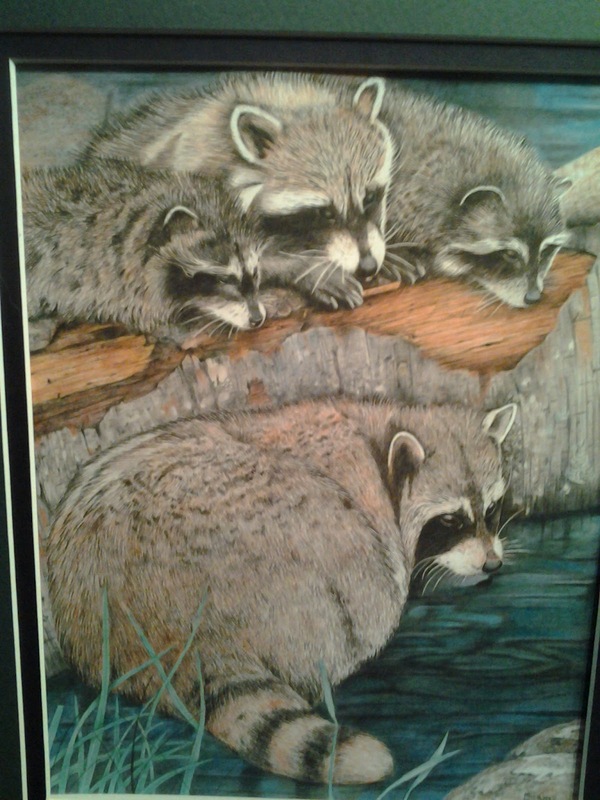 I met the artist and he told me the greatest story about a woman he met while he was drawing a similar raccoon picture. Apparently the woman came up to him and asked him why he would waste his artistic talents drawing pictures of such nasty animals. The artist asked why the woman had such a deep dislike of these clever creatures. The woman told him how one time she had found a raccoon in her shed, tried to chase it out and when that didn't work, tried to pick it up and carry it outside. To her dismay the raccoon repaid the favor by trying to bite her. "That," she quite confidently told him, "is why I am convinced they are horrible creatures." The artist thought for a moment, and then re-framed the situation. "So what you are telling me," he said, "is that you cornered a wild animal in a dark, confined space, chased it around for a while, tried to pick it up and then it tried to bite you." "Well," the woman huffed, "when you put it that way, you make it sound like it was my fault!" I have not forgotten the story and every time I look at the picture, I can't help but bring to mind what I am now calling, The Raccoon Principle. Our members are trying to bite us. And yes, it might be our fault. So often we hear association executives and staff lamenting memberships that seem to be "turning on them." And why, why, why is this happening to us! We live for the members! All we do is help the members! Don't they know how much we do for them?!?! What is the problem THIS time!?!??!??! Now, I am not talking about the steps we sometimes have to take in order to contain the occasional trouble-maker with a truly negative (not innovative) disruptive agenda. There are times when we have to take action and corral a director who has gone berserk, or a chapter that is engaging in activities that could damage the whole. What I am talking about is the systematic marginalization of members that is happening on a more and more frequent basis. This "dismissal" of member involvement is often done in the name of efficiency, time and money savings or just sheer helpfulness - our best "here-let-the-staff-do-that-for-you" instincts. Who can argue against helpfulness or efficiency? I agree that in many cases, staff experts can make areas like professional development and conference planning, publications, etc., run much more smoothly and efficiently. I am a big believer that a professional staff can bring a level of quality and polish a typical volunteer will never be able to achieve on their own. However, in our zeal to "help" the members sometimes we try to take on too much. In asserting our professional competence, we have forgotten to give members additional outlets to practice their leadership skills and to exercise their autonomy. We prepare candidate slates with only one person per position and then wonder why nobody votes. We handpick committee chairs, make individuals feel like those decisions are foregone conclusions and then wonder why nobody serves. We create "collaborative" processes, but then exert a great deal of control over the outcomes leaving members feeling like the whole thing was rigged...(like they were accomplices instead of participants)...and then wonder why they aren't happy with the results. Then members get bored. Or frustrated. Or worse, they feel trapped. Then they bite. And we claim we don't know what in the world could have brought that on. It might be the Raccoon Principle. Sometimes, it might be us. Just sayin'. Hi Shelly - I think this experience cuts both ways. As a volunteer at an association (I've sat on various boards) I've sometimes found that I'm at loggerheads with staff because I fail to recognize the skills and experience that they have with respect to running the organization. But I agree that the reverse does occur, and there are times when I feel that my experience within the profession has not been recognized/appreciated. This is particularly challenging in areas where there is some overlap. For example, my profession is software development, and the association delivers services/products which are embodied in software. I thought it requires thoughtful people on both sides of the equation to actually make progress. Thank you for sharing this! Too often we bite off more than we can chew and get bitten in return. The Raccoon Principle is a good reminder. Thanks for the comment Nikki! I will send you a link to the artists website once I find it! Here's to a bite-free week!